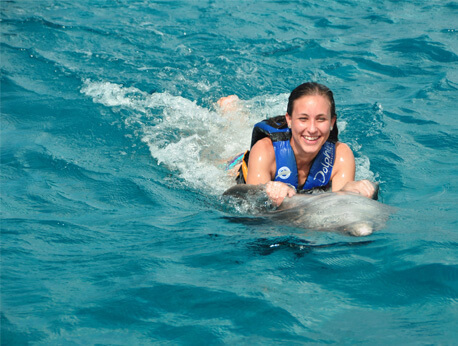 Enjoy getting to know more about dolphins by engaging in the swim adventure tour offered at Dolphin Cove in Ocho Rios. The dolphins at Dolphin Cove are friendly and lovable creatures, and you can interact with them by kissing them, hugging them, shaking their hands, splashing with them and even catching a ride on their bellies with them when you take the Dolphin Cove swim adventure tour. If you're one of the many people who's enamored with the sea and marine life, then our swim adventure tour at Dolphin Cove in Ocho Rios might be right up your alley. You and your family can enjoy interacting with the playful creatures that are dolphins in the pristine waters of Jamaica. Perfect for children and adults of all ages, enjoy a swim in the deep sea alongside these beautiful mammals. If you're lucky, you might be able to share a kiss, a hug, a dance, or even a hitch a belly ride with our dolphins that are completely human-friendly. In addition to interacting with the dolphins, there are various other activities that are included in our tour, some of which include guided snorkeling and interacting with stingrays. Of course, all our stingrays have had their barbs removed so that they pose no threat to you, and because they were bred and raised by humans, they are friendly and accustomed to people. You can also enjoy glass bottom kayaking in the Caribbean Sea or even be the captain of your own mini boat. When you're done swimming and interacting with our marine life, there's plenty to keep you occupied on land as well, such as venturing down our Jungle Trail where you can view and interact with exotic bird species, snakes and other animals. For a relaxing and educational source of entertainment, check out the Shark Show that not only allows you to view amazing species of sharks, but also gives you the opportunity to learn tons of interesting facts about the marine world in general. In addition to all the above listed activities that come with your swim adventure tour, there are various other things to do at Dolphin Cove in Ocho Rios. For instance, you can get your hair braided in the traditional style of the local Jamaicans, sample the tropical fruits, and even try some of our world-famous Blue Mountain coffee that we serve up everyday at our Star Buccaneer's Coffee Shop. Our tours are designed for everyone, but there are a few regulations that must be upheld on our tours. Because we go out in deep waters, all participants of our tour must know how to swim, and children under 4'7" must be accompanied by an adult. Additionally, children under the age of 8 will only be able to participate in the dolphin kiss, hand target and handshake activities for their own safety, and a life jacket is required for all participants.